Nine times out of ten, dainty jewelry is my go-to when accessorizing an outfit. I think there’s something so feminine about it, especially when it’s rose gold. If this sounds right up your alley, you have to check out TOUS. TOUS is an amazing company that has been in the watch and jewelry making business for almost 100 years! I always know anything I pick up from them is going to be high quality, including the pieces I styled for today’s look. This necklace is my absolute favorite right now. It goes perfectly with my everyday style. The dainty chain and simple circle shape are made of sterling silver and coated in 18kt rose gold vermeil. This keeps the necklace affordable, but still very stunning. Maybe even the perfect Christmas gift? I think so! Another item I would highly recommend from TOUS as a Christmas gift to yourself or a special lady in your life is this rose gold watch. It’s adorned with the tiniest crystals that give it just the right amount of sparkle. You can wear it dressed up for a special occasion or add it on as an accessory with jeans and a wrap sweater like I did here. Are you as in love with rose gold as I am? What’s your preference between silver, yellow gold and rose gold? TOUS has a little bit of everything, so definitely go browse! A big thanks to TOUS for sponsoring this post! Great post! 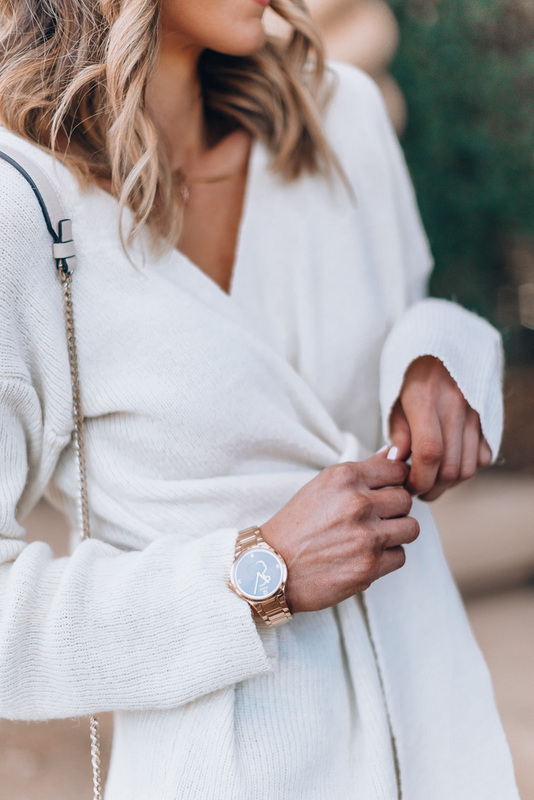 Rose gold is my favorite gold color right now, and i love all rose gold accessories!